The Oppiliappan Temple, also known as Thiruvinnagar or Uppliyappan Temple is a Sri Narayanan temple located near the village of Thirunageswaram in Kumbakonam of Tamil Nadu, India. 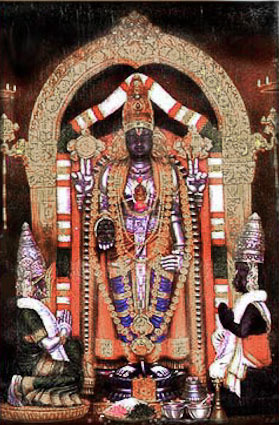 The presiding deity in this temple is Lord Uppiliappan Perumal with his consort Bhumi Devi and her father sage Markandeya. The temple is one of the 108 Divya Desams. The legend associated with the temple goes like thus- Once Tulasi did penance and asked to be given special place in Lord Narayana's chest like Goddess Lakshmi. Lord Narayana said that Lakshmi occupied that position after severe penance and she was about to incarnate on the banks of river Cauvery in Earth with the name of Bhumi Devi. The Lord asked Tulasi to appear there prior to her as a tulasi plant and Lakshmi will incarnate under Tulasi's shadow. Tulasi obeyed the order and became tulsi bushes on the Cauvery banks. Since Tulasi supported Lakshmi's incarnation, Lord Narayanan rewarded Tulasi as being very special to him in the temple. It is beleived that one who worships Narayana with Tulsi leaves will get the effect of doing an Ashvamedha yagam. Meanwhile, Mrikandu Maharishi's son, Markandeya worshipped the Lord Vishnu and desired that Lakshmi should be born as his daughter and the Lord himself should become his son-in-law. One day, when Markandeya reached Thiruvinnagaram, he felt that this was the right place for getting his desire fulfilled. Markandeya then started a severe penance for 1000 years seeking Lakshmi's blessings. After thousand years of severe penance, Lakshmi appeared as a baby under the already incarnated Tulsi plant . Markandeya felt the presence of Lakshmi as the incarnation in the form of the baby and realised that a part of his desire had been fulfilled. He took possession of the baby and raised her. When this young girl reached adolescent age , on a day in the panguni month of Sravana Nakshathram, the Lord appeared as an old man and asked for the hand of Markandeya's daughter in marriage. Markandeya replied that her daughter is too young and could not even cook with proper salt in the food,to which the Lord in the guise of the old man replied that he was ready to accept her and her cooking without salt. Markandeya later realised this was none other the Lord narayan himself and offered his daughter's hand in marriage and performed the kannikaathaanam of his daughter (Lakshmi) to the Lord. Since the Lord had said that He will accept the food that is not salted as His best and most desired food, this temple Neivethiyam is always done without salt in any food. The name Oppiliappan ( uppu illa appan) is as result of this legend. Inscriptions here date the temple during the period of Rajendra Chola.The temple has a 50 feet high five tiered Raja gopuram facing east and has two prakarams. Stone inscriptions here refer to the temple as Tiruvinnagar - Tirunageswaram and Uyyakkondaar Valanaadu. Oppiliappan stands upto 8 feet tall in the centre. Below him Bhoomidevi faces north in a kneeling posture while Makandeya Maharishi who has the boon of retaining his age as 16 forever is the position to the marriage to his daughter. Inside the praharam, alwars' sannidhis are seen in the northern side. Then we can see sannidhis for Krishna and Sri Rama.Garuda's sannidhi faces towards the sanctum sanctorum. Behind the Garudan's sannidhi is the dwajasthambam, bali peedam and an eight pillared mantap. We can see beautiful paintings of dasavatharam and inscriptions of the 'Thirupavai' pasurams. There is a small 'thulabaram' to the right side before you enter the sanctum sanctorum. Devotees can offer anything as per their vow except salt . The prasadams like tamarind rice, fried snacks are prepared witout salt. If one tastes them inside the temple, they seem to taste normal. If they take them outside and eat them, they can realise that it does not contain salt. Sravanam is very special here. During that day devotees take a dip in the temple tank and get the darshan of 'sravana' deepam. Another beleif is that if you offer sandal and kumkum you get salvation from brahmahathi dosha. Offering of doopakal,deepkal and bell will releive you of all sins. People offer black peppers with salt at Lord Narayana's feet in front of the Garudazhwar, to cure them of any dermal diseases. It is believed that praying to Lord and Mother in the temple would ensure unity among the couples and cultivate harmony in their life. There is also a story behind the tank in this temple. There lived a king called Devasarma and he became passionate about Zaina muni's ( a rishi) daughter and had wanted to forcibly take her. Seeing this the rishi cursed him to become a bird. Realising his mistake he pleaded to the sage for forgiveness. The sage softened by his pleadings asked him (who had become a bird ) to go to Markandeya kshetram ( now oppiliyappan koil) and hang himself upside down in a tree like bat. The King did as was told and one night when there was a storm and the branch of the tree the bird was sleeping on broke and fell into the water of this tank. The bird which got dipped by this accident in the tank regained its original form as the King and since then this is known as the only theerththam that one can take bath even in the night. 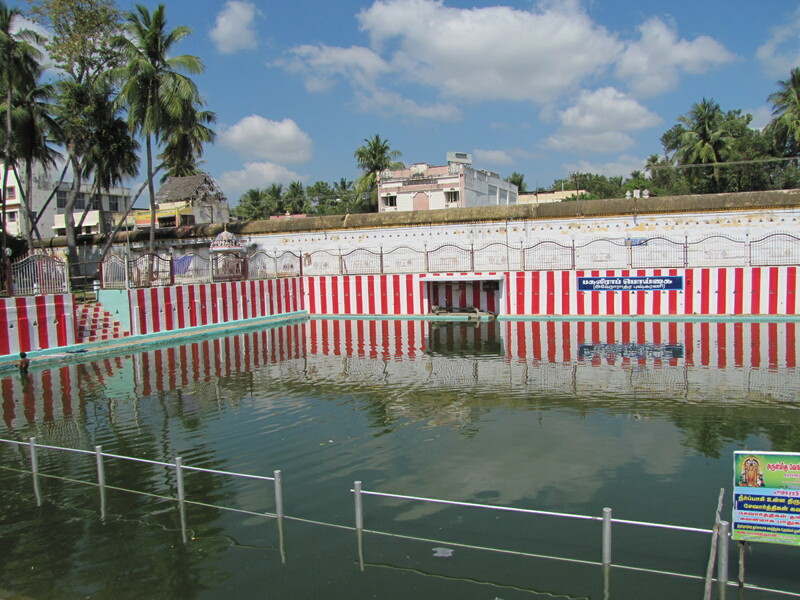 In general bathing in temple tank in the night is not recommended by our scriptures but the rule is exempted here and hence it is called "ahoraathra pushkarani" ( Ahoraatra in Sanskrit meaning day and night). Panguni ( mid Mar - mid Apr) - Srirama Navami utsavam for 10 days. Marghazhi ( mid Dec - mid Jan) - Pahal pathu for 10 days and Rapathu 10 days. Temple location Oppiliappan Koil, 7 kms away from Kumbakonam town. Oppiliappan koil is well connected by bus services from Kumbakaonam. Autos are economical and charge within Rs 100 for a round trip from Kumbakonam. ( be preapred to shell out waiting charges ). If you drive your own car , it is just a few kilometers away from Kumbakonam town. Where to Stay?There are a few hotels in Oppiliappan koil itself, but I would recommend the hotels in Kumbakonam. There are several budget hotels and deluxe hotels in Kumbakonam. Other interesting places around Oppiliappan koil Thirunageswaram one of Navagraha sthalas is just a kilometre away. Tiruvalanchuzhi, Patteswaram durga are also very nearby. Contact Sri Oppiliyappan Temple, Thirunageswaram, Kumbakonam- 612-204. Thanjavur District.